"WG.31 - HIGH CROSS of SAINT PATRICK - (8.5 in.)" 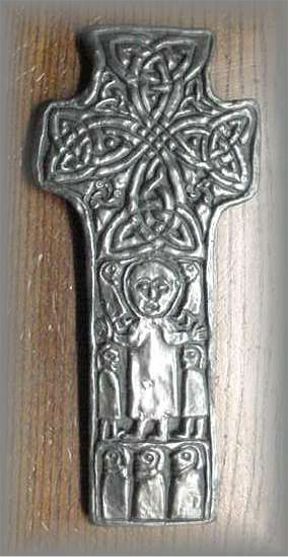 HIGH CROSS of SAINT PATRICK: This cross is the oldest of the great high crosses from Carndonagh Co. Donegal. The original is 10 feet high, 7th century. At the bottom, there are 3 pilgrims, midway, Christ with 4 evangelists, at the top, interlacing pattern used in Celtic art to indicate the ineffable, "Christ be with me - Christ be before me, Christ be behind me, Christ be within me. WILD GOOSE QUOTE: The oldest of the great Irish high crosses, dating from the 7th century. It stands 10 feet high, dominating a street in Carndonagh, Co. Donegal. The immediate appeal to those seeking a gift for an Irish person is self-evident. The mystery of its powerful symbolism we endeavor to unravel for you. HAND CAST IN KINSALE IRELAND BY WILD GOOSE STUDIOS: Each of these beautiful reminders of our faith is hand cast in bronze and in iron. A shell is formed in metal then filled with a resin. Each piece is then polished, leaving a deep rich patina. This remarkable technique creates a plaque that is not only beautiful but lighter in weight as if solid, would be very heavy and very expensive.